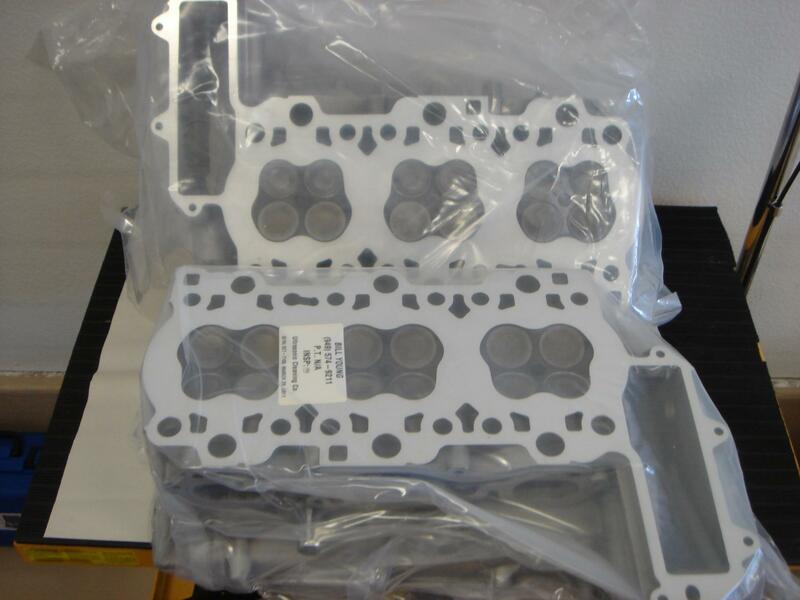 looking to install a 3.4 intake manifold in my 3.2 equipped boxster. I have the 987 airbox and maf, 996 throttle body, and customer intake tube already, so I'd like to put on the 3.4 manifolds. Also have 987 engine cover for more clearance. 3. Fuel rail from a 996. Is this correct? Any other tips or parts necessary? i looked into this and i *think* that you may have to fabricate a braze-on or somesuch out of JB weld to create a place to drill and tap for one of the spots required to attach the lower runners to the head. and yes, fuel rail has to change - mounting points are different. you could fabricate new tabs on the rail if you are ballsy enough to weld a fuel line, but note that you have to be bang-on as it is only the two fuel rail fasteners per side that keep the injectors in. thanks. I don't mind getting new fuel rails from a 996. I'm assuming they just bolt on in reverse? never heard the jb weld sitch on one of the intake runners though. well, the fuel lines run over the transmission end in a 996, and if you put a 996 intake on a 986 you have to reverse the whole intake (to get the TB over the transmission end) so the fuel lines will be in the right place when all is said and done. you'll have to figure out how to adapt the 986 fuel lines to the 996 rails - porsche looks to use 1-time barbed fittings, but i've read that with heat you can get them off with no damage and then just hose clamp them when reinstalling (perhaps with some fuel-rated thread sealant?). you'll also have to extend your brake booster vacuum line to the other end of the engine. I've put a 3.4 intake on a 3.2. I believe all I had to do was drill and tap the heads. I used the 3.4 fuel system but had to use the 3.2 boxster wire harness. I went over it on my build thread. i stand corrected! post 243.
woody, awesome, thanks. how did you run the shifter cables and were there any issues getting everything to fit? Would Cayman 3.4 runners be more easily adapted? I trimmed a little bit of the upper engine cover area in the back so the intake tube wouldn't rub and a little in the front to clear the intake. Other people said they didn't have to do any trimming but did have to drop the motor an inch or so. I tried to run the cables under the intake but that didn't work for me. I can't remember why. I have them going over the top now with no real problems. I wish I had gotten the 3.2 dyno'd with that 996 intake, custom exhaust and 996 ROW tune. I bet it would be putting out the same HP as the 3.4 I have in it now. I also have the cables over the top of the intake but on a 3.4L. I currently have a hard top on but it’s coming out off soon when my suspension shows up I can grab pictures of the routing if needed. This is a 3.4 swap like woodys. sounds like over the top it is. If I have to lower the motor a bit, that should not be an issue when combined with the 987 engine cover. Can you guys discuss what modifications were necessary to the fuel system and or 996 fuel rail to make this work? Very interesting! Does anyone have power numbers or Dyno charts showing gains from using the 996 manifold on the 3.2? I'm really interested to see just how much power could be made with our 3.2. Given that the 2.0 in the 1967 911R & 904 made 220, why can't we get 350 from the 986 S motor? Woody posted some surprisingly good dyno results from bolt ons and ECU tunning. I would link it if I could find it. If we get into the heads and start doing it, how is the 3.2's propensity for head cracking mitigated? One could asks this for a total engine build as well. Last edited by jaykay; 11-13-2018 at 09:37 AM. Last edited by BYprodriver; 11-13-2018 at 02:39 PM. Back in 1967 the HP numbers were gross, not net. The difference is that they could measure the output with no accessories attached, open exhaust, no air cleaners, etc, in whatever temperature and conditions the maker wanted. Now the numbers are far more accurate, because the conditions of the measurement are standardized, and all the accessories are attached and functional. Your 220 HP in 1967 would probably measure under 200 HP using the SAE net ratings. Last edited by itsnotanova; 11-14-2018 at 03:28 AM. Indeed. Care to share specs? Bigger valves? where in the heads was the porting done, and how much larger are the runners now? I've got the 74mm TB & a splitter in the intake (Pedros Garage). the rest of my intake is 3.2, but I know the TB made a difference. I wonder what an 82mm TB (GT3) would do. I've put this out there before, but my car made 244RWHP with all of the bolt-ons.